Lockheed Martin has announced successful completion of a key requirements review for the GPS IIIB satellite series under the U.S. Air Force’s next-generation GPS III Space Segment program. Lockheed Martin Space Systems, Newtown, Pennsylvania, is working under a $3 billion development and production contract from the U.S. Air Force to produce up to 12 GPS IIIA satellites, with first launch projected for 2014. The contract includes a Capability Insertion Program (CIP) designed to mature technologies and perform rigorous systems engineering for the future IIIB and IIIC increments planned as follow-on procurements. 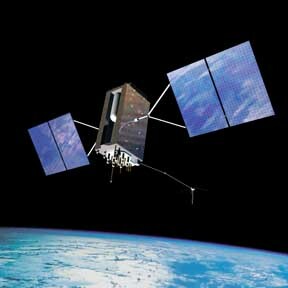 GPS IIIB will enable a cross-linked command and control architecture, allowing these GPS III vehicles to be updated from a single ground station instead of waiting for each satellite to orbit in view of a ground antenna. GPS IIIC will include a high-powered spot beam to deliver greater M-Code power for increased resistance to hostile jamming. The Lockheed Martin-led team, which includes ITT and General Dynamics, recently completed a two-day GPS IIIB System Requirements Review (SRR) with the Air Force at Lockheed Martin’s facilities in Valley Forge, Pennsylvania. More than 170 attendees participated in the SRR, including representatives from the GPS Wing, Air Force Space Command, the Defense Contract Management Agency, the OCX Ground Segment team, the Federal Aviation Administration, and user communities. "The GPS IIIB SRR was a success," said Lt. Col. Don Frew, GPS III Squadron Commander. "Lockheed Martin demonstrated to the government that the team is working to a solid requirements baseline and developing a mature design beyond what we normally see at a SRR. The successful review demonstrated to the customer and user community the Lockheed Martin team’s understanding of the inherent product development and technology maturity risks, how they will be met, and the program’s readiness to continue to the GPS IIIB System Design Review. The GPS IIIA satellites will deliver significant improvements over current GPS space vehicles, including a new international civil signal (L1C) and increased M-Code anti-jam power with full earth coverage for military users. The Lockheed team, which is progressing in the GPS IIIA Critical Design Review (CDR) phase of the program, has completed more than 80 percent of the planned CDRs and is well on its path to the overall space vehicle CDR in August, two months ahead of the planned schedule. Successful completion of the space vehicle CDR will allow the team to enter the production phase of the program.